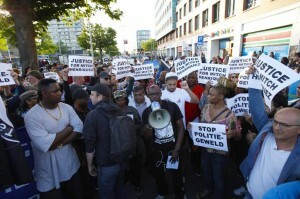 THE HAGUE, WILLEMSTAD – A demonstration yesterday evening at a police station in Schilderswijk, which is a neighborhood in The Hague, the Netherlands, got completely out of hand. Hundreds of people expressed their anger over the death of the 42-year-old Aruban Mitch Henriquez who died after his arrest. The crowd threw rocks, fireworks and other objects at the agents. Politicians are also involved in this case. Dutch MPs from the Socialist Party (PS) submitted questions about the death of the Aruban to the President of Parliament. Other parties in Aruba and Curacao are also insisting on a thorough investigation into his arrest and death of Mitch Henriquez.